That is where I am right now with this quilt. It is missing a few things but those I want to add while quilting it. For now it feel ...empty. It is missing it's story so until he tell it to me, I will put him aside. Your peacock is looking so beautiful Yanicka! I am imagining all the details you will add when you quilt it and I bet that adds a lot to his story. How beautiful! I think quilting will make it feel less empty. I find that my quilts always feel "empty" at this stage. 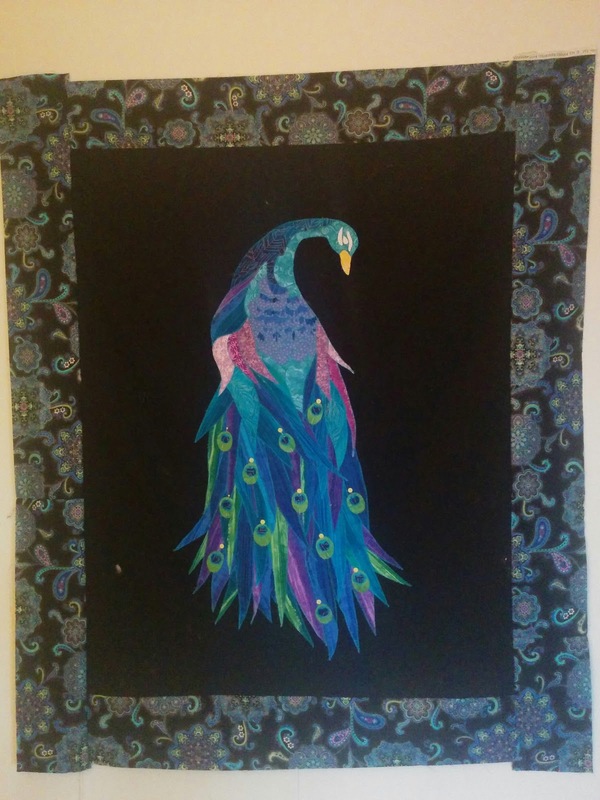 Then when you start quilting, it comes to life. It's beautiful. And going to be exquisite after quilting. Your peacock is absolutely gorgeous! Wow, beautiful! I think the quilting is all the embellishment you'll need. I think it is gorgeous! Above my skill set but I look forward to seeing the quilting you do on it. He's very beautiful Yanicka. Looking forward to seeing his completed story. Thanks for linking up!